In a previous article we said that we hoped to write a bit more about the fugitives who escaped the destruction of Atlantis and how they fared in the various places they fled to. In this new investigation in three parts we make good that intention and discuss the colonies the Atlanteans founded around the world. But we must not fall into the trap of thinking that Atlantis was destroyed all at once. Apart from the greatest disaster which we believe occurred some 80,000 years ago, the remaining parts disappeared gradually, and as the continent was a vast one, it is but reasonable to conclude this took place over an immense period of time, as we told you in our first article about Atlantis published in 2014. Nor should we imagine that the Atlanteans were one people, like the British or Americans for example. Not only were there many different nations in Atlantis throughout its long history, but several different races too, just as we find throughout Europe today, which future historians may well consider as a continent just as vast and diverse as Atlantis was. So in Atlantis there were white, brown, red and black races. In the north dwelt the ancestors of the people we now find in Scandinavia and Scotland, though the Scots are really Irish in the last place, and Atlanteans in the first, with the exception of the many peoples who invaded Scotland from time to time, as well as Ireland and England, as we discussed in our article about the origin of the Druids. But the extraordinary part of all this is that even the invaders were often descendants from Atlantis, though mixed with the blood of the so-called 'Aborigines' of Europe. It is impossible after this length of time to fit the jigsaw puzzle of races together in such a way that we get a clear picture of the whole history of Atlantis, for there are no complete records of any sort; all we have is based on hearsay and the reports of old historians and writers, as well as of travellers, some of which are less accurate than others. So we must use both deductive and inductive reasoning to get at least some idea of what might have happened, without resorting to the wilder speculations of some psychics who have written about Atlantis. This then, is our aim in this investigation; to consider the legacy of Atlantis, its peoples, arts, sciences and culture, basing our research on the best sources available to us. If you have not read our previous articles on Atlantis, now is the time to do so, to familiarise yourself with the subjects we shall discuss with you. You may also wish to read our articles about the Druids, Stonehenge, and the ancient Egyptian colonies in England, all of which have an important bearing on the legacy of Atlantis. We would emphasise that we ourselves have no doubts about the existence of Atlantis, or its location, which was in the mid-Atlantic ocean, not in the Mediterranean, Antarctic or North Sea, as some have suggested. We say this after a lifetime spent investigating the subject in a thoroughly scientific manner from every conceivable angle; geographically, ethnographically, linguistically, astronomically, and anthropologically, to name but a few of the different scientific tools which are needed if we wish to arrive at the truth. Before we begin, let us throw overboard the unrestrained admiration we often read and hear about whenever Atlantis is mentioned, and let us remember that the Atlanteans consisted of human beings who were no better, or worse, on the whole, than the peoples who clutter this earth today. Then we shall have at least a chance of arriving at the truth. But we must not forget either that there was a time or times when great Sages and Initiates did thrive in the continent of Atlantis, whose beneficent wisdom was spread far and wide, as we discussed with you in our article about the Druids. It is due to these Divine Beings that much of that which was great and good in Atlantis has today become the heritage of the wise. But there were never many of these Great Ones, nor ever will be, and this is in accordance with the great Laws of the Universe, and in accordance too with the evolution of man, who learns most during times of travail, wars and sorrow, and not in ease and plenty. If this thought irks you, then look deeply into your own heart and life and ponder on what your meditations reveal to your thinking mind! In our afterword to this and the next two parts of this investigation, which are being published at monthly intervals, we review and discuss the Oera Linda Book. Our regular readers will recall that we referred to this book in our first article about Atlantis. In this investigation we shall tell you much more about it, so as to build up as complete a picture of Atlantis and its legacy as it is possible to do in the limited time and space we have at our disposal. In our first article about Atlantis we told you that this island continent was situated in the Atlantic Ocean opposite to modern Spain, and that it stretched both southwards and northwards. We based this on Plato's descriptions of Atlantis given in his dialogues Timaeus and Critias, in which we may read: "In front of the mouth which you Greeks call the pillars of Heracles (modern straits of Gibraltar), there lay an island which was larger than Libya and Asia combined." We are well aware that some modern writers have placed Atlantis in the Aegean, others in the North Sea, and yet others in Antarctica. We shall return to these speculations later, but for the moment we simply wish to say that we place considerably more value on the testimony of Plato, who lived in times much nearer to the destruction of Atlantis, than the modern 'experts' who dismiss his account as an 'allegory'. A very approximate idea of the probable size and location of Atlantis at the height of its civilisation may be gained from the map reproduced below which we included in our first article about the Lost Continent. This is taken from the books of James Churchward. In Plato's Critias we are told that the fall of Atlantis took place about 9,000 years before Plato's time; but as we discussed in our previous two articles, this applies only to a portion of Atlantis, and not to what happened to it for several thousand years before and afterwards. Please bear this in mind. Hence when Plato was told that the first King of Atlantis was called Atlas, and that Atlantis itself was called Poseidonis we have but part of the truth, for the country called Poseidonis must have been but a small portion of the great Continent. Plato also mentions various names, such as the part of the continent of Atlantis which was called Gadirique, situated near the Pillars of Hercules, of which an echo remains in the name of the city of Cadiz. Proclus, the Neoplatonic philosopher and classical commentator on Plato's works, relates that there was a traveller named Krantor, who visited the Egyptian city of Sais 300 years after Solon, and that the priests of the temple of Neith showed him certain columns with hieroglyphic inscriptions. 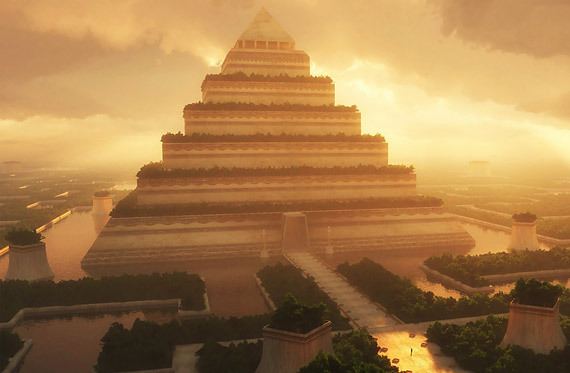 These ancient texts told the story of Atlantis and her people, and it was identical with the story Plato passed on. All the ancient authors, with the exception of Aristotle, believed Plato's Dialogues to be a true description of events which took place 9,000 years before his time, in the Atlantic Ocean, and we have no reason to doubt the veracity of their testimony. What is even more remarkable is that the records shown to Krantor by the Egyptian priests went back more than 80,000 years before his time. Incredible as this may seem to some readers, these records have recently received confirmation from two Ukrainian scientists, Manichev Vjacheslav and Alexander Parkhomenko who, in 2008, presented a paper to the International Conference of Geoarchaeology and Archaeomineralogy held in Sofia in Bulgaria, in which they set forth their arguments that the Great Pyramid and Sphinx are 800,000 years old, based upon geological studies of the plateau upon which these monuments stand. This seems a little far-fetched to us and we await further confirmation. But in the light of this discovery it does not seem unreasonable to believe that the greatest upheaval to overwhelm Atlantis occurred some 80,000 years ago as the priests told Krantor. At the time of the great disaster the repercussions must have changed large parts of the geography of the earth. Thus, as we mentioned in our article on the Story of Atlantis, what is now the Sahara Desert, was once known as the great Lake Tritonis, which may have been a gulf, or an inland sea, like the present Mediterranean Sea. At the same time the European-African Isthmus may have been destroyed, so that the waters of the Mediterranean as well as of Lake Tritonis may have rushed out upon the Atlantic Ocean after Atlantis sank, thus leaving a great gap in the midst of the waters. This re-adjustment probably caused the earth to tilt towards the north, though this may have come to pass over many, many centuries, or even thousands of years. You will note that we repeatedly use the word 'may', and one cannot do otherwise, for to dogmatise about such events would be very foolish indeed. In 1969 Professor Galanopoulos in his book, Atlantis: the Truth behind the Legend, tried to 'prove' by means of geophysics that Atlantis must have lain somewhere in the Aegean, pinpointing its location on the small, volcanic island of Santorini. This theory, which remains popular today, demolished Plato's account and all the works based on ancient sources at a stroke! We are afraid we cannot accept the good professor's so-called 'proofs' for the simple reason that it is quite impossible for Plato, Theopompus, Diodorus Siculus, Proclus, Hesiod, Herodotus, Homer, Strabo, Pomponius Mela, Cosmas Indicopleustes, and a host of other eminently wise men of the past, who all affirm that Atlantis was situated in the Atlantic Ocean, to have been either deluded or liars, or both! The 2nd century Roman author, Aelian, in his Varia Historia, states that Theopompus (400 B.C.) recorded an interview between the King of Phrygia and Silenus, in which the latter referred to the existence of a great continent beyond the Atlantic, larger than Asia, Europe and Libya together. Proclus quotes an extract from an ancient writer who refers to the islands in the sea beyond the Pillars of Hercules (Straits of Gibraltar), and says that the inhabitants of one of these islands had a tradition from their ancestors of an extremely large island called Atlantis, which for a long time ruled over all the islands of the Atlantic Ocean. The Roman historian Marcellus speaks of seven islands in the Atlantic and states that their inhabitants preserve the memory of a much greater island, Atlantis, "which had for a long time exercised dominion over the smaller ones." 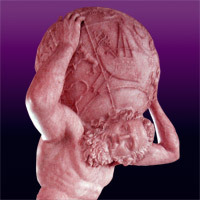 Diodorus Siculus relates that the Phoenicians discovered "a large island in the Atlantic Ocean beyond the Pillars of Hercules several days' sail from the coast of Africa." But the greatest authority on this subject is Plato, who had no doubts where Atlantis was situated, and whose descriptions of the island continent we quoted in a previous article. And so we could go on, quoting one source after another in confirmation of his testimony. More recently, 'Doggerland', an area of dry land that may have stretched from Scotland to Denmark, and is thought to have sunk between 18,000 B.C. and 5,500 B.C., has been put forward as the site of Atlantis. These findings recapitulate the theories of Jürgen Spanuth and others who located the lost continent in the North Sea, as described in Atlantis of the North, published in 1980. As we discuss in our afterword on the Oera Linda Book, these speculations are not entirely wrong so far as some of the northern parts of Atlantis are concerned, but cannot be applied to the entire continent, unless we wish to dismiss the testimony of all the ancient writers we cited above. Yet other researchers have placed Atlantis in the Black Sea, in Turkey, Spain and even in Antarctica as we mentioned earlier! We may dismiss all these and similar fanciful theories as the fantasies they are. Most writers on Atlantis mention Plato as their main source of information so far as antiquity is concerned. But as we have said, many other ancient writers made either direct or indirect references to it. But we must be careful here! Just because some tale of olden travel was written a few thousand years ago does not mean that Atlantis is indicated every time. For example, when Homer talks about the nymph Calypso, daughter of the giant Atlas, that story about Ulysses spending much time in the nymph's grotto on the Island of Ogygia, probably refers to the Canary Islands, though it is also true that these islands are a remnant of Atlantis, as we mentioned in a previous article. Diodorus of Sicily says that the Phoenicians found, among other islands, a great island in the Atlantic Ocean, but again, this may as well refer to Cuba, or Jamaica. And when Pausanias tells us about a group of islands in the same ocean, he may have been referring to the Caribbean Group, which he calls the Satyrides. On the other hand, when writers such as Strabo tell us about the islands which the Greeks called 'Blessed', and the Romans 'Happy', which he says were situated 750 miles West of Hades; by which he does not mean Hell, or some such place, but the town we know today as Cadiz, then this may refer to Atlantis, or parts of it, for we know of no other islands in the Atlantic Ocean which can be considered as 'happy' or 'blessed' as Atlantis was at the height of its power and glory. Note that we repeatedly emphasise the words 'probably', 'might' and 'may', for as students of Occultism, it behoves us to stick firmly to facts when such are available, and when they are not, exercise caution and critical thinking! What is not in doubt is that a race once existed in Atlantis which was as high above the 'culture' of the rest of mankind in those times as the European and American peoples are above the most primitive tribes of today. Whether this eminent race lived near the shores of what is now Spain, or whether it lived further inland of Atlantis, we cannot say, nor does it matter. But certain things point to the possibility of this, for after one of the later disasters which befell Atlantis, there was a sudden influx of a highly civilised people into Egypt as well as Central America, though no one today can fix any certain date for this and we will not try either. Did the middle part of Atlantis sink first, leaving shattered islands all around in the newly formed Atlantic Ocean? We do not know, any more than anyone else knows. And did that high civilisation first develop in the centre of Atlantis? We do not know this either, and no one else knows it, so all is conjecture here, and we must accept this if we are to investigate these things honestly without resorting to fanciful speculations as so many writers about Atlantis have done, and still do. But we can say that the geographical boundaries of the culture of Atlantis can be traced to a small extent if we take into consideration that peoples from it flocked into Friesland and Scandinavia, into Ireland, Cornwall and even to the land now called England; and into Brittany, Central America, Bolivia, Spain, France and Egypt. And though there are many resemblances in those various cultures, none is exactly the same as the rest, anywhere. Yet the inner core of these cultures, in its primeval perfection, may have originated in the centre of Atlantis, and as people fled away from it, various parts of this first culture were taken to different places, and in the course of time, each part took on its own characteristics, though based upon the parent culture of the oldest times of Atlantis. This reminds us of the sons and daughters of one family, who all have certain family likenesses, yet each are built up in their own personal way, each developing in another direction, but with traces of their joint early education and experiences, varying according to their genius. We can learn from the study of Geology (though that too is guesswork to a rather large extent), that during the present Quaternary Epoch the Earth's surface has been torn and rent under the impact of tremendous natural forces, and those writers are correct when they presume that mankind must have witnessed several of these cataclysms. It certainly has, and the ancient, sacred books, such as Enoch, the Popul Vuh, the book of Revelation in the Bible and many others are filled with records of these events. Should you wish to make a deeper study of such things, we refer you to these books and works on geology, which we cannot discuss here, or else we should be writing this investigation well into the next century, and still not come to a final conclusion. We have no ambition to live so long! But there are traces of Atlantean Colonies everywhere, more or less developed, and along the Gold Coast of Guinea marvellous prehistoric monuments have been found by the German archaeologist Leo Frobenius, who also found a bronze statue of the god Olokun, the African Poseidon, in the neighbourhood of the mouth of the Niger, in Yorubaland (now part of Nigeria). In the Americas, many, many such relics have been discovered, and no one can account for their presence there. So the peoples of Atlantis reached all sorts of places, even to the Near East, and Greece. In all those places the cultures of Atlantis, in the plural, flourished in accordance with the knowledge, or the lack of it, of the people who arrived there at all times from the remnants of the old continent. According to the German archaeologist, Professor Paul Borchardt (1886-1953), the salt-marshes of Chott el Djerid in southern Tunisia represent the dried bottom of Lake Tritonis. As we mentioned in our previous article on Atlantis this has now been identified from Space, confirming the accounts of Diodorus of Sicily, Herodotus, Pomponius Mela and other ancient writers. On the maps of the medieval geographers of Arabia the name of this region was 'Bahr Attala', which means: 'The Great Atlantean's Water'. Others say it was the present Sahara, but Borchardt thinks that Bahr Attala was the original Atlantic Sea, in which Plato placed his Poseidonis or Atlantis. We do not agree with the eminent professor in the least, for no matter how large the water surfaces in Africa, there was not enough to fill the present Atlantic Ocean with them, even with the help of the Mediterranean, and possibly other seas of olden times. And though, no doubt, Atlantis was a very large continent indeed, it was not so huge as we see it described in some maps in the books on Atlantis where its 'exact' size and situation for the last million years or so are given. Let us leave such fantasies to those who adore them and stick to facts only! The Sahara desert may yet reveal many more traces of the Atlantean colonists to future generations, less sceptical than our own. One such was the archaeological expeditions led by Byron Khun de Prorok in 1925, when he found the mausoleum of Tin-Hinan, which contained the supposedly prehistoric queen of the Tauregs. 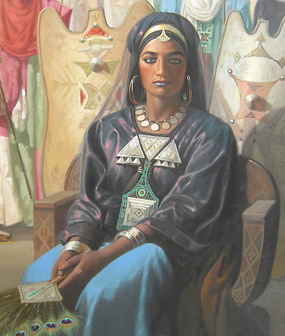 According to the stories told in the region, Tin Hinan was a 'fugitive princess' who had been driven from the northern parts of the Sahara and established her kingdom further south. This mausoleum is situated in the Saharan oasis of Hoggar, in the western part of the desert, about parallel with the Canary Islands. Here was the body of the ancient queen, dressed in silk, and in a very good state of preservation. On her head was a golden diadem, studded with stars, made of precious stones, and her hands and feet were covered with golden and silver bracelets inlaid with gems. A beautiful statue and many precious objects were found near the body of the queen, and her skull is remarkable for its harmonious proportions and indicates her origin from an advanced race. A modern artist's impression of the queen is shown at left, though we can't vouch for its accuracy! An anthropological study of the remains published in 1968 concluded the skeleton was that of a tall woman belonging to an unknown Mediterranean race. Was this a queen of one of the Atlantean Colonies? Very probably. Colonel Braghine, in his fine book The Shadow of Atlantis, which we reviewed in our first article on Atlantis, gives some interesting examples of words which he thinks might all have an Atlantean origin though found in widely separated nations. Let us quote a few here. He says: "The ancient Greek word Theos (God) sounds in the Toltec and Mayan languages teo; the Arab word malka (king or tribal chief) re-appears as melek in Hebraic and startlingly enough as malko amongst some Indian tribes; to the Uzbek (a Central Asian tribe) the word tepe (mountain, or hill) corresponds to the tepek of the Central American Zapotecs." We will give you two examples of our own, firstly the Egyptian word for the sacred Scarab beetle, which is kheper or kheprer. Now, in ancient Egypt this word was pronounced 'kafer' (kayfur), and in modern Dutch the beetle is called a keever, pronounced 'kafer' also, and in German it is käfer, pronounced exactly the same way. We do not know if there is in any other language a word similar to this for beetle, but is it not strange that this word appears in Egyptian, Dutch and German? And the pronunciation being practically the same in all these three languages? Our second example is even more ubiquitous and also Egyptian, and this is the well-known black wood—Diospyros ebenum—or ebony, which many of you will have seen and handled in the form of small pieces of furniture or ornaments. This word was written as hebni in ancient Egypt and pronounced 'hebahnee'. We find the word written almost the same way and pronounced the same in many European languages. In French it is ébenè, in Spanish ébano, in Greek ébenos, in Dutch ebben, and in German ebenholz (holz being the German for wood). In most Slavonic languages it is eben, heben or ebonit. This may very well be an Atlantean word still in use after millions of years! And so we find the same similarities between the Mayan and Greek languages, and the Yucatan and Hebraic, though Greek again, belongs to the family of Indo-Germanic tongues, and seems to derive from the Sanskrit, though that too, probably came from Atlantis in the first place. There is an unknown alphabet which the Brazilian scientist Dr Gustavo Barroso mentioned in his work called Aquem da Atlantida, found in all countries. This alphabet, or these letters, are found on the Onega Rocks, in the virgin forests of Brazil, and in European Russia, to mention only few countries. Is all this due to Atlanteans? We doubt it; perhaps there was some world-wide race in pre-Glacial periods spread all over the earth? But how does this account for all the races that at one time lived in Mexico, for instance? Whether the supposed translations of some Mexican inscriptions, made by Brasseur de Bourbourg and Augustus Le Plongeon in the 19th Century were correct is more than we should like to assert. Their work has been greatly doubted by other scientists, but that means very little for these 'experts' are always arguing with one another. Yet, Le Plongeon showed that thirteen signs in the hieroglyphic writings of the Maya are absolutely identical with the Egyptian forms. More recently, Professor Barry Fell, in his books America BC (1976), Saga America (1980) and Bronze-Age America (1982) provided numerous examples of Old World scripts to be found on rock surfaces and objects all over North and South America. These books are well worth reading. As to the name Atlantis, or Atlantic Ocean, there is not a single satisfactory etymology giving the right answer so far as European languages are concerned, with the exception of the Oera Linda Book, which science ignores. But in the Nahuatl language of Mexico we find the radical a, atl, which signifies water, war, and top of the head, as we can read in Ancient America by John Baldwin, published in 1871. From this comes a whole series of words, such as tlan, meaning 'on the border of or amid the water'. We also have atlaca, 'to combat, or be in agony'; it means also 'to hurl or dart from the water', and in the preterite makes Atlaz. A city named Atlan existed when the continent was 'discovered' by Columbus, at the entrance of the Gulf of Urabá, in Colombia. We also have the Atlas Mountains on the shores of Africa and the Aztec people came from Aztlan, in Central America. The strange behaviour of certain birds which migrate from Europe to South America each year has also been observed by many people. These birds, when reaching the Azores, turn back and fly round and round for some time, as if some instinct told them that they had reached their yearly destination. This is a hereditary memory which can be accounted for only if we assume that land existed in the long ago where now Atlantic waves cover the sunken territories. After some unsuccessful searches, the birds turn round again and proceed to South America. It is the same with many useful plants, which are found only in the cultivated state these days. It has been assumed that the Atlanteans cultivated these plants for so many centuries, or thousands of years even, that they no longer occur in the wild state at all. These are such plants as tobacco, wheat, banana, maize and pineapple. The cultivated banana bush is found in the most isolated places, and on solitary islands in the Pacific. It is not propagated by means of seeds but by offshoots only. How, then, did these bushes reach these lonely islands? As to wheat, which is also thought to be a plant first tamed and cultivated by the Atlanteans, a wild species of it was found some years ago in the Himalayas, by a Russian scientific expedition. This, however, does not do away with the fact that the Atlanteans brought wheat to Britain with the Druids. According to Egyptian lore, it was Osiris who first taught the Egyptians the use of wheat, but some say that Osiris came to Egypt from Atlantis, and others contradict this by telling us he came from the Caucasus. All this may be a way of saying that Atlantean colonists did this, though 'wheat' also had a deeper, symbolic significance in the Egyptian Religion, being an emblem of Wisdom among other good things. But in spite of the assertions of the Egyptologist Flinders Petrie, wheat was not known in Babylonia, which is nearer to the Caucasus than is Egypt. But eventually the Egyptians introduced wheat into Babylonia, which means that the Atlanteans did this. The sort of wheat we are now discussing is the so-called Badrian type, but before its time there was another kind known to the Babylonians, and this, in turn, was later introduced into Egypt. Though wild tobacco has not been known for many centuries, here again, a Russian naturalist, Professor Bondar, discovered a wild species in America. On the Assyrian and Babylonian monuments we find images of the American variety of pineapple! How did this plant come to be in both these ancient lands? The facts are so bewildering that no-one can account for them all, unless we accept the theory that the Atlanteans were responsible for the spread of these plants and their cultivation. Again, it may be that they learnt all this from an older civilisation; perhaps from one in America, who, in turn had it from someone else, the Lemurian for instance; No-one can tell for certain. We have mentioned Lemuria several times in this investigation but do not intend to write about it at length now or in future, for we should have to speculate such an extent that our theories might have as little value as the rest. Any reader who wishes to read about Lemuria is referred to the books extant on this subject, and all we can say is that we are sure that Lemuria, or whatever was its name, existed, and that the peoples of Japan, China, and Northern America (as far as their original, native inhabitants are concerned) may have come from Lemuria in the first place. But we should not lose sight of the fact that in the north of this world there existed great continents once upon a time, with tropical climates, and inhabited by many animals now known only in the tropics, though countless species have died out completely, as we know from their remains found in Siberia and elsewhere. Both Lemuria and Atlantis have been called 'Mu' by James Churchward, who mixes them up in his books on these subjects which we mention elsewhere on our website. But we are quite certain that they were separate continents, Atlantis in the Atlantic Ocean and Lemuria in the Pacific, and that the latter preceded the former in time by many millions of years. Some writers have stated that Lemuria had existed for some five million years before it disappeared in a manner similar to Atlantis. Perhaps they are right, we do not know. 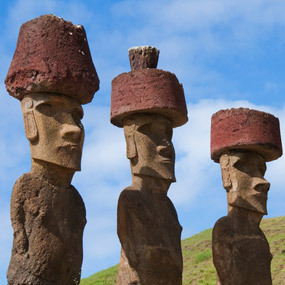 Structures, said to have been built by the Lemurians, have been found along parts of the South American border of the Pacific, along the shores of California, and parts of Nevada, as well as the famous statues to be found on Easter Island. This shows, if correct, that the Lemurians reached America, and so spread over parts of it, and eventually may have reached Atlantis long ago; and this is the only reason why we refer to Lemuria at all. But, please, remember that this is all conjecture, though we do believe that there is an underlying basis of truth in it all. When we discuss Atlantis, we must never lose sight of Lemuria, or else we shall be side-tracked in the same manner as Churchward, Lewis Spence and a host of other writers and scientists, who cannot see farther than their noses, though the evidences of truth are only half-an-inch away. And remember too that the Lemurians were not just one single race, but consisted of as many races as there were in Atlantis, or as we can find in Europe, or any other continent today. So neither the Japanese, Chinese, Polynesians, Malays and the rest of the Far East, were direct descendants of Atlantis, but came from Lemuria instead. As to the Semitic races, namely the Phoenicians, Arabs and Hebrews, we think that they were of the same stock as the Sumerians, who constituted the first wave of refugees or emigrants from Atlantis. The Sumerians must have preceded even the so-called 'Akkadians'. After them came either a wave or infiltration of Phoenicians, and they were followed by the Arabs, and still later by what are now called the Jews. Perhaps there was a Semitic nation in Atlantis once, parts of which fled in widely separated periods of time as the continent gradually disappeared, each taking on different names, yet being of the same origin and stock. There are so many statues, masks, and engravings of peoples with distinct Jewish features in South America that Semitic colonists from Atlantis must have lived in America from the beginnings of time, though probably never in great numbers. In the second part of this investigation we explore the rich legacy of Atlantis further, and in the sidebar afterword, tell you more about the wise laws and customs of the survivors of the destruction of Atlantis recorded in the Oera Linda Book. © Copyright occult-mysteries.org. Article added 20 January 2019. In our afterword to this investigation which is being published in three parts, we examine the laws and customs described in the Oera Linda Book, many of which find their parallel in ancient Egypt, Peru and among the Maya of Central America. From this we may be tolerably sure they reflect the same or similar laws and customs of parts of Atlantis, which the Atlanteans carried with them on their migrations to Europe and the Americas. The Oera Linda Book is contained in a manuscript of the 13th century, itself a copy of a much older book. The original Frisian text was verified by a Dr. J. O. Ottema, also a Frisian, who made a Dutch translation of the MSS. Later on this was again translated into English by William R. Sandbach, and published in London by the great firm of Trübner & Co in 1876. As we told you in our first article about Atlantis, when the book appeared in English the 'learned' critics of the time called it "an impudent Imposture," whilst most modern scholars call it "a hoax or forgery." In this, and the next two afterwords, we shall see what truth there is in these criticisms, if any. Let us deal first with the accusation that the book is a hoax or a forgery. In his introduction, Dr Ottema, makes a number of statements which the critics have never satisfactorily refuted. Referring to the original MSS, he tells us that: "The paper, of large quarto size, is made of cotton, not very thick, without watermark or maker's mark, made upon a frame or wire-web, with not very broad perpendicular lines. An introductory letter gives the year 1256 as that in which this manuscript was written by Hiddo overa Linda on foreign paper. Consequently it must have come from Spain, where the Arabs brought into the market paper manufactured from cotton." Similar paper has been found in the Imperial Library of St Petersburg, in Russia, in the oldest Chinese documents held there. Dr Ottema goes on to say: "In old writings the ink is very black or brown; but while there has been more writing since the thirteenth century, the colour of the ink is often grey or yellowish, and sometimes quite pale, showing that it contains iron. All this affords convincing proof that the manuscript before us belongs to the middle of the thirteenth century, written with clear black letters between fine lines carefully traced with lead. The colour of the ink shows decidedly that it does not contain iron. By these evidences the date given, 1256, is satisfactorily proved, and it is impossible to assign any later date." On the subject of language, he writes: "It is very old Fries, still older and purer than the Fries Rjuchtboek or old Fries laws, differing from that both in form and spelling, so that it appears to be an entirely distinct dialect, and shows that the locality of the language must have been (as it was spoken) between the Vlie and the Scheldt." One of the most compelling facts for the authenticity of the book is the mention in it of a visit made by the Frisians to the lake-dwelling peoples of Switzerland, who built their houses on wooden piles on the shores of Lake Zurich. These ancient dwellings were not discovered until 1854 when the commune of Meilen took advantage of exceptionally low water levels to start building a harbour on the shore of Lake Zurich, and quite by chance, unearthed a number of odd-looking, superbly preserved ancient artefacts, and a series of wooden poles embedded in the mud. The diggers had found the prehistoric lake village, more than 500 years after the MSS was copied by Hiddo overa Linda. Another remarkable statement in the book is that in 1550 B.C. Frisians travelled to India under the guidance of a priestess named Geert, and settled in the Punjab, where they adopted the name of Geertmen. This people were known by only one Greek historian—Strabo—who mentions them as 'Germanes', differing totally and entirely from the 'Bruchmanes' (or Brahmins) in manners, language, and religion. Alexander the Great, in his Indian campaign, which began in 326 B.C., discovered a race of Scythians, that is white men of European origin living in the Punjab. In the maps made by Ptolemy we find at exactly 24°N on the west side of the Indus, the name Minnagara; and a little east of that, at 22°N., another Minnagara. This name is pure Fries and comes from Minna, the name of a Frisian priestess whose history is related in the book. Perhaps the most damning indictment of the assertion of forgery made against the book, is that the MSS of 1256 is not original, but a copy, as we said earlier. This is proved by the numerous faults in the writing, as well as by some explanations of words which already in the time of the copyist had become obsolete and little known. A still stronger proof is that between pages 157 and 158 one or more pages are missing, which cannot have been lost out of the manuscript, because the pages 157 and 158 are on the front and the back of the same leaf. Page 157 finishes thus: "Three months afterwards Adel sent messengers to all the friends that he had gained, and requested them to send him intelligent people in the month of May." When we turn over the leaf, the other side begins, "his wife', he said, who had been Maid of Texland, 'had got a copy of it." There is no connection between these two passages. There is missing, at the very least, the arrival of the invited, and an account of what passed at their meeting. From this it is quite clear that the copyist must have turned over two pages of the original instead of one, which leads to the irrefutable conclusion that there must have been an earlier manuscript, and that it was doubtless written by Liko oera Linda in 803 A.D., as the book tells us. In our view this is compelling evidence for the book's authenticity. But it is entirely up to the reader to accept or reject it. Those who wish to explore this question further are referred to the aforementioned introduction, which can be read in full online, for we have said all we wish to say on the subject. As for the modern criticisms that the book promotes Nazi ideologies, we might say with considerably greater justification that the Bible promotes even worse ideologies since it has been the cause of untold suffering and evils throughout recorded history and is still used to defend the most iniquitous ideas and incite religious hatred and bigotry today! So let us dismiss this criticism with the contempt it deserves. Let us rather give the last word to Dr Ottema, who says: "And here we find in our fatherland a very ancient people in possession of development, civilisation, industry, navigation, commerce, literature, and pure elevated ideas of religion, whose existence we had never even conjectured." We agree, but those ideas were hoary with age long before the Oera Linda Book was written, for they are the legacy of Atlantis, carried to every corner of the globe by the survivors of the cataclysms that destroyed it, as we shall now see. Now in this book it is claimed that the Frisians were once inhabitants of Atlantis, though they do not place Atlantis in the same spot as Plato did, but said that it stretched out far to the west of Jutland, of which Heligoland (German 'Helgoland'—note the similarity to 'holy land'—German 'heiligeland') and the Frisian Isles are the last barren remains. Plato, on the other hand, placed Atlantis beyond the Pillars of Hercules. In the Oera Linda Book we are told that Atlantis, or Atland as the Frisians called their original home, was submerged in 2193 B.C., and that the survivors fled to Friesland and Greece, and that Minerva, or Min-erva and Minos were Atlanteans, and that Min-erva landed with a fleet off Jon, otherwise lona, at the head of a colony in Attica. In order to discover what sort of civilisation existed in Atlantis, say 10,000 years ago, we need to consider a few of the laws the Frisians brought with them to Friesland in the years after 2193 B.C., according to the record in the Oera Linda Book. Those ancient peoples who arrived from Aldland, or Atland, believed first of all in freedom, and the very name Frisian, means 'Free Man'. They still have their own language and customs today, and these are different in many ways from the rest of the Dutch provinces, of which Friesland is one. One of their sayings was that 'prosperity awaits the free'. This is a law of their great Goddess, Frya, and she says, "Him only can I recognise as free who is neither a slave to another nor to himself." These are wise words. She further says, "When in dire distress, and when mental and physical energy avail nothing, then have recourse to the spirit of Wr-alda (God); but do not appeal to him before you have tried all other means, for I tell you beforehand, and time will prove its truth, that those who give way to discouragement sink under their burdens." Here we have something with which no priest will agree, yet, in these few words we see a great Law, a wise Law, and a true Law which it would be good to meditate upon. Frya says: "To God's spirit only shall you give thanks, threefold, for that which you have received in the past; for that which you have today, and for that which you hope for in time of need." There were three goddesses known to the descendants of the Atlanteans, and they were; Lyda, who was brought forth out of 'fierce heat'; Finda, out of 'strong heat'; and Frya, out of 'moderate heat'. After God, or Wr-alda, had 'breathed his spirit upon them', they came into existence, especially upon Frya, so that she might become a link between God and Man, that the latter might take pleasure and delight in the visions of God, or in other words, that men might behold nature and know it to be God's own creation, for the benefit of all mankind. Each of those goddesses bore twelve sons and twelve daughters, and thence came all mankind. Now all this, and what follows, is highly symbolical, as we're sure some of our readers will recognise, but it is worth pointing this out to those who know little or nothing of the truths and facts concealed in myths and legends of this kind. We are next told that the goddess Lyda was black, with hair curled like a lamb, and her eyes shone like stars (a clear reference to the planets of our Solar system), and shot out glances like those of a bird of prey. She was also very acute, could glide about like a snake, and was strong and nimble. She was violent too, and her voice was loud, and when she screamed in anger, every creature quailed. She had no regard for laws, and her actions were governed by her passions, and at last she 'died', turned grey by her own mad behaviour, and heart-broken on account of the wickedness of her children, who accused one another of their mother's death and howled and fought like wolves, while the birds of the air devoured her corpse. How familiar all this sounds today when the world is ruled by men and women who are slaves to ambition, material power, wealth, fame, and all the rest of the passions of the lowly-evolved! The second goddess, Finda, was yellow, and her hair was like unto the mane of a horse, and she was so strong that where Lyda killed one lion, she killed ten. She was a most seductive lady, with a voice sweeter than any bird's, and her eyes were alluring and enticing, but whoever looked into them became her slave. She was most unreasonable, wrote thousands of laws, but never obeyed a single one herself. She despised the frankness of the good, and gave herself up to flatterers. She was utterly vain and loved no one but herself, while at the same time she desired that all should love her. Her children were of the same nature, and, no doubt, you have met a few of them here and there—we certainly have! Finda was most treacherous, and died at a ripe old age, but no one knows how she died. Frya, on the other hand, was as white as snow at sun-rise, and the blue of her eyes vied with the rainbow. She was beautiful, and like the rays of the sun shone her hair, which was as fine as a spider's web. When she opened her eyes, the birds ceased to sing in their astonishment at her beauty, and the leaves quivered not. One glance of her sweet eyes made the lion lie down at her rosy feet, and the adder to withhold his poison. She was pure, and her food was honey, and her beverage the dew gathered from the cups of flowers. She was sensible too, and the first thing she taught her children was self-control, and the second, love of virtue, and when they were grown up she taught them the value of liberty, for she said: "Without the virtue of liberty, all your other virtues serve to make you slaves, and to disgrace your origin." Most happy goddess, for her children clustered about her like unto the hosts of the starry firmament! Could one wish for a better description of the Mother of All than this? The same Mother Principle that we find in ancient Egypt in the person of Isis. Beautifully concealed in several symbols, here is the Great Mother of our Kosmos, or Solar System, the Lady with the sun and stars around her head and the moon and stars at her feet, from whose womb the manifested life has arisen. Nearly every word of these descriptions of the three goddesses of the Frisians is symbolical of some sacred and hidden Teaching, wonderfully preserved in this manner for the Few who are capable of recognising and comprehending it. What a marvellous and 'impudent imposture' it all is! If we are to believe the ignorant critics mentioned before, which we assuredly do not! Just before Atlantis was destroyed, Frya sent warning to her own children, who were, of course, the wise ones of Atlantis, who had learnt to open the inner senses, and could see and hear the beauties of the Higher Realms by means of long and careful training in the Occult Sciences, and hear the wise words of the Sages and the Saints above, who speak unto their own on behalf of the Mother of All, here called Frya. And after she had spoken, "the earth shook like the sea of God. The ground sunk beneath the feet of the Atlanteans, the air was dimmed by tears, and when they looked up to the Mother (those who were not destined to be saved), she was already risen to her watching star. Then, thunder burst from the clouds, and the lightning wrote in fiery letters upon the firmament the word 'Watch!" The land had now become a sea, all except that part which had not been destroyed, and to which the wise had fled, heeding the warning. They were obedient to the Word of the Mother, and they built a high mount, upon which they erected a strong citadel, and upon its walls they wrote certain words of Wisdom, that they should not be forgotten, and the ones who were bound to come should know and recognise the ancient laws, and teach wisdom to those who desired to listen, just as was done in ancient Egypt, when the Great Pyramid and other sacred buildings were erected by the fugitives who arrived there. The writers of the Oera Linda Book were rather scandalised that some of the Atlanteans took to their home such peoples as the Laplanders, and the Finns, as far as their womankind was concerned. They do not mention the word 'marriage', but there were offspring of these unions, and these were not always proof that mixed blood produces fine children. So when we read that the Norsemen were pirates and ruthless murderers and thieves, we know how this may be accounted for to some extent. 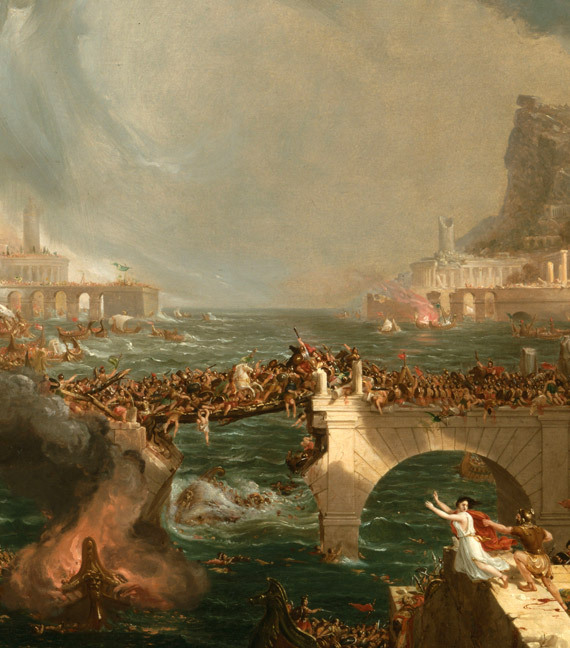 The taint lasted for many centuries, and even in the ninth century A.D., we hear how the ancient piratical spirit of Greece (to quote one example) was revived among the fierce Danes and Norwegians who led a life of constant rapine and bloodshed; of interminable warfare at home, of frightful devastation abroad. The old Vikings were not quite so romantic and admirable as many modern historians tell us today. Turner, in his History of the Anglo-Saxons, states that the sea-kings of the north were a race of beings whom Europe beheld with horror. Without a yard of territorial property, he says, with no wealth but their ships, no force but their crews, and no hope but from their swords, they swarmed upon the boisterous ocean, and plundered in every district that they could approach. It is said to have been a law in the north that only one male child should be selected to remain at home to inherit the government. The rest were exiled to the ocean, to wield their sceptres amid the turbulent waters. The consent of the northern societies entitled all men of royal descent, who assumed piracy as a profession, to enjoy the name of kings, though they possessed no territory. The sea-kings had the same honour, but they were only a portion of those pirates, or Vikings, who in the ninth century were covering the ocean. Not only the children of the kings, but every man of importance equipped ships, and roamed the sea to acquire property by force. Piracy was not only the most honourable occupation and the best harvest of wealth; it was not only consecrated to public estimation by the 'illustrious' ones who pursued it, but no one was esteemed noble, and no one was respected, who did not return in the winter to his home with ships laden with booty. All these were the descendants of the 'great' Atlanteans, the mysterious people whom some consider to have been a race of heroes, and sages, and even divine personages. True, there was the admixture of strange blood, but one cannot ascribe everything to this after all. Those Vikings acted very much like the gangs of thugs in all parts of the world today, and it is difficult to find any sort of admiration for those ruthless bullies and murderers if one thinks of the crimes perpetrated since the Second World War in all parts of the world. Our discussion of the Oera Linda Book is continued in the second part of this investigation.